Since a podcast is really just a blog with an audio file attached, I use WordPress to do my podcast management. I got an email from a friend who’s starting a new podcast and thought I’d make a list of the plugins for WordPress I find useful on my blogs and podcasts. PowerPress is a new one for me. In the past I tired another plugin, but it broke with an update to WordPress and no one updated it. Forever. So I got rid of the plugin and just let Feedburner do the massaging of the RSS feed to make it work for podcasts. But recently the guys at the ProMed Network suggested I use RawVoice for stats and when I went to look into setting it up, I found they use a newly updated WP Plugin called PowerPress. It seems to do all kinds of things and do them right. So I updated first the EMS podcast and then, since it worked so well, and having real stats was so great, I switched my photographer podcast over as well. Couple of quick things I like. I used to use Audio Player to put a player in the post. It worked great, but I had to put in a tag to get it to work the way I wanted. With PowerPress, I don’t have to do it that way. Another thing PowerPress does is provide a download link in the player. I used to have to remember to add HTML to the end of every post just to do that. It was prone to not getting updated and point to the wrong MP3. Now it is handled automatically. Subscribe To Comments lets people get an email if someone comments on a comment they’ve commented on. This helps drive by commenting bring people back. Example: A potential reader sees a post via a friend from Facebook to my blog. They go read the post and have an opinion. They post a comment, then leave for parts unknown on the internet. I see their comment and say something in reply, maybe referring them to another post on the site of relevance. And that is the end, because they never go to my blog again. Now have subscribe to comments installed. They post a comment and click the subscribe check box. Now when I reply they come back. Maybe reply back. Maybe look at the other post. Another chance is made to get them to subscribe or continue a conversation. Yet Another Related Posts Plugin puts a list of other posts it thinks are relevant under each post and it is pretty good. This give people a reason to stay and check more stuff out. Every blog needs a plugin that gives people things to click on that help share the post. The most important right now is Facebook. SexyBookmarks is the best one I’ve found. It looks cool. It’s simple, and it hides a ton of options, but makes them there if the user wants them. CommentLuv – because I think it gives people incentive to comment. Dofollow – because comment spam is handled by moderation and I’m fine with Google crawling to commenter’s sites. WordPress Database Backup – because 1 is none and 2 is one. This post is part of my Better Podcasting series. Another aspect of design is being able to find what you are looking for in a site. Yes it needs to look good, but it also needs to accomplish your business goals. Now look at your site. Does that one thing catch your eye immediately and is easy to figure out? Ask someone who isn’t familiar with your site to do the same. Or ask them to do the thing you want them to do and watch to see how hard it is to do. How many clicks does it take? For instance my #1 goal is to get people to subscribe to my email list. On P&M the sign up sheet appears from the bottom of every blog page, and it is a big yellow banner on the right side of the page. It can be accomplished by going to the site, typing in 2 fields and hitting return. 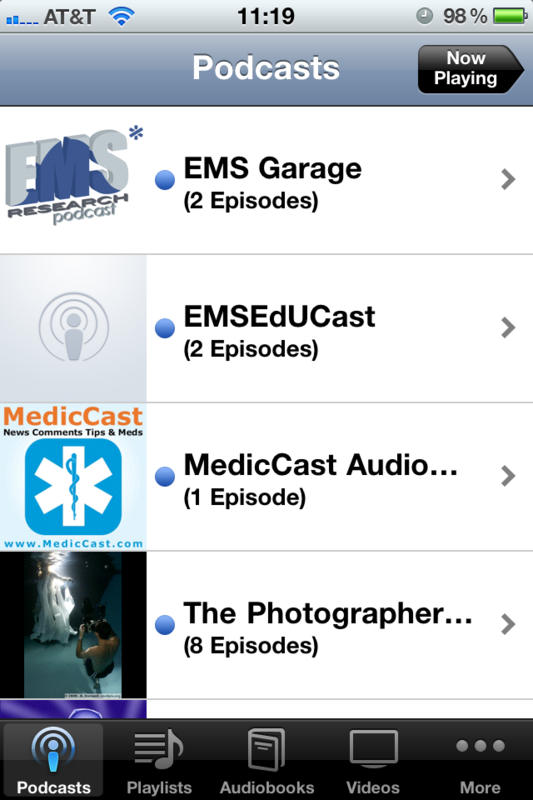 The primary goal of EMS Newbie is to get them to subscribe in iTunes. When you go to the site there is one button – again above the fold so you always see it – to click and they are in iTunes. As an aside, but relevant, you need an easy to remember and type URL to subscribe to your podcast. You will have to say it during your podcast and then the user will have to remember it till they are at the computer and they type it in. I do this using a redirect for both of my domains, so you can just type “domain.com/iTunes” into a browser and you go strait to the iTunes page to subscribe. There is an incredibly well done audio podcast that I listen to that does something really strange. When you got the URL with the name of the show, you get a page with 3 other podcasts on it. Huh? Where am I? Your domain name should only point to your one podcast. If you have more than on, maybe in a network, they should go to the networks’ domain. Don’t confuse people. Links to sister podcasts is fine, just don’t take me to something that confuses me. Oh and if you are going to steal a design element from Apple for your web page, you got to keep up with their changes in interface. Otherwise you look dated. To me the number one reason people go to a podcast’s website is to get links talked about in the podcast. Those should be in the show notes. You should have a link to every guest or panel member on the show. Maybe multiple links. Often people will connect with a particular person on the show and want to follow up with them. But they may not catch that info during the show, they expect it in the show notes. There needs to be a good overview of what you covered as well. It needs to be keyword rich so search engines pick it up and will send people looking for that kind of information to your show. I know a number of shows that have one line of description and a text only list of people on the show. That will drive someone nuts. Listener questions and mentions. Everyone loves their name in print. If you answer a listener question give them a little blog love. Also those questions text is good fodder for the search engines when people ask similar questions to google. Yes doing this level of show notes is sometimes a pain. It takes a while and is tedious. Create a template of the post with the parts that don’t change. Use the pre-show notes as a starting point for what is in the show notes. Transcribe your written notes into the blog post. Show notes can also go into the lyrics field of the MP3. Links in there don’t do much good, but aren’t bad to put in there. This gives someone trying to decide if you are the episode they want to listen to, so give them good information. If this all sounds like too much, get someone else to do it. Hire someone in India or the Philippines, or your teenager. Another option is to get a volunteer from the audience. Since you are going to spend some time editing the audio, you could send the raw recoding to someone to write show notes. If you have a following you can probably get a volunteer to do this for you for access to stuff earlier. This is just the tip of the iceberg for site organization, but it is the bottom of where you need to be. Design is about looking and sounding good. The stuff in Audio Quality Matters will help with sounding good, but I’d add a couple of comments about intros, outros and other audio widgets. Your intro needs to be cool. Couple of days ago I got an email from a Dutch paramedic asking for an audio file of just the intro to EMS Newbie. I don’t take any credit for that intro, it was created by the awesome Marc Moorash my audio guy. If you want to hear just the intro without my voice over is now available on the podcast page. Another example of a cool intro is the new Ambulance Matters podcast intro made by Thaddeus Setla. Intro doesn’t need to be too long. How long is two long? I don’t know but I know it when I hear it. Keep it tight. Move from thing to thing without dwelling too long. Listen to it over and over – your listeners will – and when you get bored with it you know that’s too long. Tell me what I’m listening to as soon as I hit play. Both my podcasts have a one line voice over that says the podcast name, episode title and episode number at the very beginning, before the intro music even starts. You need things to look good. There are two big places this falls down with podcasts, Album Art and Site Design. A lot of people are listening to your podcast on a smart phone or at least an MP3 player with a video display. In those cases when they look down they see the album art of the MP3 file that is playing. On the iPhone podcasts are listed with that album art showing. Again, you need to look cool. Get a good logo or title image. Confessions started out with a funny image drawn by a friend of mine, showing the newbie in the background carrying a bunch of stuff and the guru in the foreground. Says something about the podcast. We’ll be announcing a new logo next week at the Texas EMS Conference, which will replace it. Images are also good. I find a good photograph of the hosts makes an excellent draw in iTunes. My Photographer and Model logo is of me and my co-host on a dark blue background. Really stands out. And for each episode we have a different piece of cover art. An image of the interviewee for the episode. Nothing like hot models to draw in the listener. Not really audio or design related, but important. Look at your podcast on the iPhone. Preferably when there are more than one episode there. Is the title you see in that list exactly the same for every episode? This happens when you include the name of your podcast at the front of each title. Change this so listeners can read the show title. Also does it get clipped? On the photographer and model podcast the title is the kind of guest we have and their name. I discovered that if you said “Photographer Joe Blow”, the word photographer was all you saw on your iPhone. So I shortened it to “Photog”. I even had a complaint from a photographer asking me to change it because he hated photog. After explaining it he was OK with it. Another thing that pushes the title to the right and off the screen is using the complete word “Episode”. That will push things right. Just use “Ep”. People are going to go to your website. When they do it should look good and be easy to use. Too many podcast websites are the redheaded stepchild of blogs. One thing I’ve learned in 15 years as a software engineer is that engineers aren’t designers. Neither are most podcasters. Creating good design/art is a skill. For those people with it, good design comes effortlessly. For the rest of us it doesn’t come at all. It would be cool if you could afford to go to 99Designs and have a contest to get a custom WordPress theme made by a professional designer, but that isn’t always possible. So buy some prepackaged design in the form of a theme. Generally the best cost some money, but not too much and they are worth it. You need to look up to date. I’ve been to a few sites that look like they were written in the 1990s and haven’t changed yet. Use CSS and styles and look like you are in the 21st century. Use your logo elements on the website. This makes sure people know they are in the right place when they get there. If the design, including colors, elements and logos, are the same on the site and in the MP3 artwork you are good. In the next post we’re going to talk about site design from the viewpoint of organization and usability. This seems obvious. The quality of your audio is the quality of your podcast. But it seems to be one of the things that people don’t pay attention to. There are a couple of things you need to do. I’m not going to recommend a mic here, if you really want to know email me. This is the single biggest thing you can do to record it right the first time. You can fix a lot of stuff in post, but a crappy mic is hard to overcome. Telephones have crappy mics. I do an interview show and sometimes the guests are on phones. This is poor quality in general. When we send them our interviewee guide we tell them the order of preference for calling them, Skype, Landline, Cell Phone. This has everything to do with the microphone. If you are doing a regular show with others in other places, you need to just limit it to Skype with a good mic for the regulars. Yes, it is much easier to just record a live event or a quick recording and throw it up on the server. But don’t give in. I was listening to one podcast and there was a 30 second exchange where the host told someone to note the time because they really were going to edit out something they had just said. Get rid of the dead air. Another easy edit that people don’t make it to edit out long pauses. The reason I say it is easy is you can see what you need to cut. All sound editors show you a way form, and when it goes flat no one is saying anything. Just cut that out. Then go back and listen to the transition. Don’t be afraid of the do over. Once you know you are going to edit, when something goes wrong while recording you can just stop and do it again. I had the phone ring in the middle of a recording of EMS Newbie a week or so ago. I thought I’d turned them all off, but it turns out my new printer rings. 🙂 I just said, “Hang on a minute Kelly” Hit the off button on the printer, and said “OK back up and repeat what you just said.” Or we’ve had to clear crying kids out of the room. You don’t hear that on the podcast because we edit it out. We all listen to This Week in Tech and they have half a dozen people on every week. It sounds and works great. They are all calling in via video over Skype. So we think our round table podcasts should be the same. You are not Leo Laporte. Sorry. Have you seen his setup? Do you know the kind of bandwidth he has? And almost all of his guests are professional broadcasters, with years of experience working with others. My personal limit is 3 or 4 people. That is the most amateurs that can work together. They don’t walk over each other and there aren’t many long pauses while they figure out if they are the one who should answer. Also this give an intimacy to the listener, making them feel they are part of a private conversation. Speaking of bandwidth, your home DSL line or cable modem can’t hand a dozen video streams. Probably less than 3 or 4 without something breaking up. Remember your pipe is getting all of the other’s streams. So if you have 5 callers there are 5 video streams coming down our pipe. Each caller is getting 1 stream to them, but you are mediating them all. Your computer may not be able to handle everything you want it to do either. It is managing multiple video displays and recording. If you aren’t doing a live video broadcast, don’t bother with Skype video, just do audio. Related is streaming live while recording your podcast. I’ve thought about doing this with P&M, but haven’t yet because of the bandwidth issues. Remember that upload speeds on a cable modem are way less than download. So that video you are streaming up is having a big impact on the quality. In the end you have to decide what is the most important channel you are going to use. UStream live? Blogradio live? Or iTunes recorded? iTunes lets you reach literally millions of people, more than you will every have listen live. You need to optimize your podcast for that medium. Should you do video at all? Yes it is cool, but is it how your listeners want to consume your product? I generally think of people as listening to my podcasts while they are commuting, or exercising. Something that is time consuming, but not mind consuming. But it is also generally not something were they can look at a screen. So audio is the best. Secondly is there an advantage to people being able to see you? If you are interviewing, or discussing stuff, it doesn’t really add anything to see you while you do it. The benefit is not worth the extra cost and effort. If you think editing audio is a pain, try video. Hopefully these things will help improve the audio quality of your podcast. Let me know if you have any questions or comments below. If you didn’t already know this, I produce and host two podcasts, The Photographer And Model Podcast and Confessions of an EMS Newbie. I’ve been listening to podcasts for years and recently started listening to a bunch of new ones. I’ve decided to be part of the solution instead of the problem and offer some tips that may help make them better. If you are taking the time to create a podcast at all you believe you have something important to say. If it is important you want other people to hear it, and to keep listening. Starting a new podcast you can easily get overwhelmed and everyone has limited resources of time, money and expertise. You start reaching your limits and start letting things – especially time consuming or difficult things – drop by the wayside. I’m going to talk about the things that matter to your listeners and will keep them coming back. Great content is key, but I’m going to assume that. If what you are talking about has not audience or is boring to them, nothing else will matter. I was going to do it as one long post, but it got out of hand, so now it is a multiple day multiple post series and this is the introduction.